One of the most common and necessary activity in the process of constructing of cutting and forming dies is the Wire EDM process. The tool construction always implies some - more or less complex - cutting operations. Some of these may and must be automated and the others can have a great level of complexity. 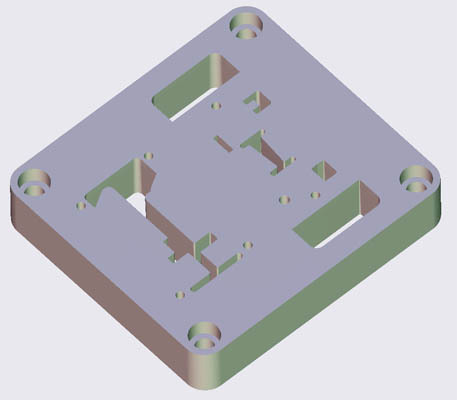 The CAD/CAM technology has traditionally been focused on manufacturing processes with a significant return of the investment and therefore has approached mainly the design and milling in 2, 2.5, 4 and 5 axes. But the processes that one could call as "minor processes", such as Lathe or Wire EDM, were considered as complementary products. The product development was affected according to this idea. Another relevant point is the presence of new products arriving to the market arena and using different selling channels such as machine vendors and distributors, usually ‘working well’ but only for some special machine and/or configuration, no support and lack of upgrading possibilities. Mold industry recession and the real need to find new markets and solutions show the die industry as the natural goal for sales growing and market share maintaining. Another important side of this question is the increasing need for complete, balanced, homogeneous and global solutions. Once inside this market, we find ourselves with the big issue of Wire EDM. It is clearly a very important activity for the production of dies. There are some aspects that we need to clarify about this: At first glance, one could imagine that the Wire Edm process is a simple production process, with easy transportability from one machine to another (like for milling, simply by choosing a different postprocessor), quick definition.... and we’ll be really far of the real situation. Being easy to work and automated must be one of the requirements, but transportability demands a deep knowledge of the cutting technology, the machine and the NC controller. Unfortunately, or fortunately for the people who know the way, it is not enough to choose another postprocessor to obtain the same cutting result in a different Wire EDM machine. Except for a few very simple cases. Another premise is that the cuts, both for the precision tooling and the automotive industry, may demand a number of changes until obtaining the valid final part, involving full 2X and 4X cutting processes, with all its different variations and using 3D geometry. Leaving aside other aspects of the technical office, we also find that it is desirable that the cutting processes can be defined at the end of the design stage, independently of what the final geometry might be. It is better to avoid the shopfloor dependencies and the unnecessary customizations for personal wishes. 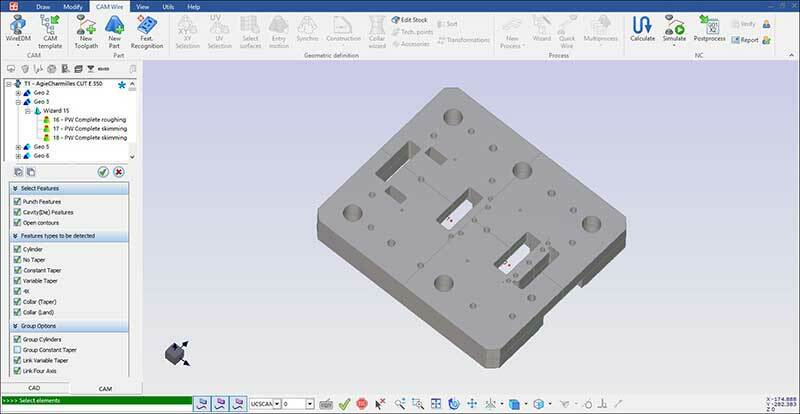 As we have discussed before, it is common to find a CAM system with some CAD functionality linked to the Wire EDM machine because they both were purchased together with no option to choose. However these systems are not offering the possibility of new programming tools for different or new machines and different ways of working. Three different machines mean three different software and three different ways of working. This is not really a comfortable situation. The Fikus Visualcam™ Wire EDM solution is one of the few CAM solutions for Wire EDM giving the right approach with all the machines and technologies that can be found in this complex field. The partnership with CIMATRON™, the integration with the AgieCharmilles machines (directly within the CNC) and the international projection are not coincidence. Cutting geometry handling, geometric updates and fast geometrical CAD analysis (many times too hard or impossible to do depending of the system), cutting procedure automation and technology wizards are simply unique. After obtaining the cutting geometries, and it is fair to recognize here the spectacular and effective CIMATRON DIE-SET™ application for the creation of progressive dies, Fikus Visualcam, not less spectacularly, is able to generate automatically the cutting procedure sequence for the parts to be cut taking into account the different technology of each machine. The cutting procedures that the user customizes can be grouped into templates for later use on a similar job. Fikus Visualcam let the user choose the technology for the specific machine. Once the geometry has been loaded, either by creating it directly in Fikus CAD or by getting it from CIMATRON™, Fikus Visualcam will automatically recognize the entry points (circle center is the common way), the cutting geometry (single elements or grouped) and Fikus Technology Wizard will apply the sequence of cutting procedures according to the technological parameters selected (material and wire types, target quality, height of the part and others). 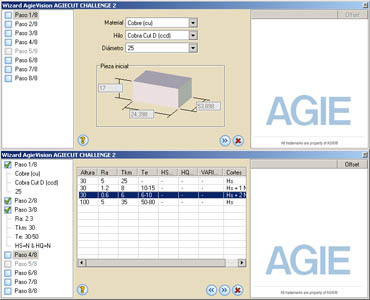 The Fikus Technology Wizard does everything automatically: Obtains the data from the geometry, reads the information input by the user and compares everything with the database supplied by the machine manufacturer to generate the correct cutting sequence. We must also emphasize here that the use of the Technology Wizard in Fikus Visualcam assures that the machine program generated is correct and prevents mistakes, so common when using the machine tables manually. And not less important, all the work is done in just a few seconds.